August 30, 2018 at 10:17 am. Some things never change in West Lafayette, Indiana. Moving into the dorms is always a challenge, Greyhouse Coffee Shop is the go-to place for an afternoon coffee and dessert, and Purdue won’t tell anyone who the starting quarterback will be. 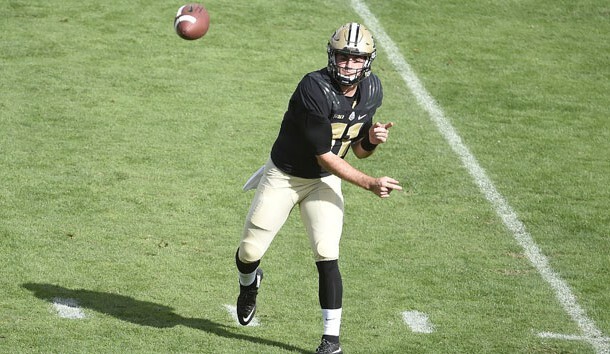 David Blough and Elijah Sindelar begin 2018 like they finished 2017 — in a fight for the No. 1 spot on the depth chart. Both spent time there last year, and both suffered from both inconsistent performances and injuries. “Both guys have had good camps and done a very good job,” head coach Jeff Brohm said. “I think they are both going to be ready to play. We’ll make sure that whoever is in there will utilize their talents and we’ll do things that they do well, but there are some subtle differences that we have to make sure that we play to their strengths and we do things they feel comfortable with. Of course, Brohm won’t get much sympathy from the Northwestern staff in the season opener. The Wildcats are dealing with QB uncertainty of their own, and in their case it’s not self-inflicted chaos. Clayton Thorson is working through a knee injury he suffered in last year’s bowl game, and while he’s expected to start on Thursday that’s far from a sure thing. For Brohm, this is no ordinary season opener, and not just because the Boilermakers open with a Big Ten opponent. The contest with Northwestern — a team that jumped out to a 23-0 lead against Purdue a year ago in earning a 23-13 win — offers the opportunity to build on last season’s momentum that saw him lead the previously woeful Boilermakers to a bowl berth in his first season. “It’s a chance to see how we measure and what we can do, and it would be great if we could find a way to win,” Brohm said. –WR Rondale Moore is a freshman in a deep wide receiver pool, but the word is that he’ll be on the field early and often. He has the speed and the hands to become the playmaker this offense has sorely needed in recent years. –RB D.J. Knox is the opening day starter, but there’s a lot of competition behind him. Markell Jones and Alexander Horvath will both see carries, and Tario Fuller and Richie Worship will be in the mix as well when healthy. –RT Eric Swingler enters Thursday’s game with something extra to prove. He grew up a Northwestern fan, but was told in no uncertain terms that he wouldn’t even be welcomed as a walk-on. He’ll enter his senior season as a key part of the Boilermaker offensive line. –LB Markus Bailey is one of just four returning starters for Purdue’s defense, and arguably the most important. He’ll be looked upon not only to keep making plays in both run and pass defensive sets, but to help his less-experienced teammates get comfortable in a hurry.